THE BOOK: Drunk on Salt. THE EDITOR: Designed by Dorian Karahalios; edited by the M.F.A. graduate students at the University of East Washington at Spokane. THE PUBLISHER: Willow Springs Editions, in the Acme Poem Company Surrealist Poetry Series. SUMMARY: This is a short book of twenty-four uncollected poems, almost all of which have been previously published in magazines and anthologies, everywhere from Lawrence Ferlinghetti’s City Lights Review and the Southern Poetry Anthology to bilingual magazines edited in Barcelona and Amsterdam. Several have been translated into Spanish, and I have performed many of them at my readings in San Francisco, Barcelona, and New Orleans. Most of these poems are what I call “tribal” or public poems, rather than personal, and several—about immigration, AIDS, inequality, terrorism, and the homeless—pack an in-your-face political punch, either incantatory or satiric. I’ve been missing the public face of poetry in contemporary American letters, a tradition that goes back to Walt Whitman, and so I chose to include poems that speak both to us and about us. When politicians and pundits lie and manipulate so routinely, who can we look to for the truth but poets? The more personal poems are formed out of my own rootless imagination, offering a map of “the long ride home” to my native New Orleans from lives in San Francisco, Spain, Morocco, India, and elsewhere. Of course, the ultimate “ride home” is toward dying, and as I learned from my Spanish mentor poets, nothing comes alive without acknowledging the power of death’s duende to seduce, enchant, and inspire. THE BACK STORY: A former writing student of mine teaching in the M.F.A. program at the University of East Washington at Spokane invited me to submit a manuscript to be published in the Acme Poem Company Surrealist Poetry Series. At first I wasn’t so sure. Am I really a surrealist poet, from that by-now musty avant-garde school started more than a century ago by André Breton? Yet in looking through my uncollected poems, I realized a certain kinship with surrealism through the profound influence of Spanish-language poets such as Neruda and García Lorca, many of whom I’ve translated. In the first poem in the manuscript, “Nostalgia for the New,” set at the Salvador Dalí Museum in Spain, I focus on my own third-generation relationship with old fuddy-duddy surrealism, which has definitely lost its shock appeal. The editors balked at including my more political poems, but I insisted that the roots of surrealism were not only esthetically rebellious but politically so. After all, Lorca was assassinated by Franco’s fascists and Neruda was a card-carrying Communist for decades. Most of the political poems stayed. I tied the title, esthetic, and poetry together by choosing as the cover art a work by the internationally celebrated surrealist lithographer Warrington Colescott. My friend Warrington, who is ninety-six year old and also has New Orleans roots, generously agreed, and after many hassles getting permissions from museums, the marvelous cover design came together. To top it off, I dedicated the book to a dear, recently deceased friend, the surrealist Beat poet Philip Lamantia, who as a young man had been mentored by André Breton. So across the generations, the book came together like a family reunion. WHY THIS TITLE? 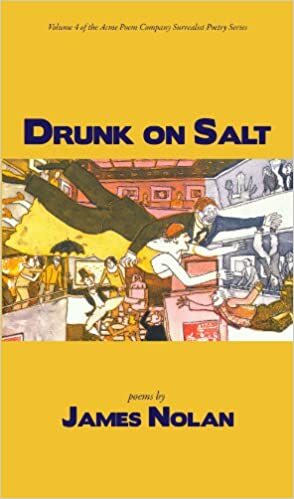 : “Get drunk on salt!” is a flamenco refrain—“Qué te emborraches de sal!”—shouted at performers to encourage them to soar into ecstatic inspiration. The book’s title poem is in homage to the late great singer Camarón de la Isla, a meditation on inspiration and death written after I saw one his performances in Barcelona. The poem was translated into Spanish by the famous Mexican poet José Emelio Pacheco, so I’ve had the electrifying experience to read it to guitar accompaniment as part of flamenco shows, along with other of my flamenco poems. Growing up on the blues in New Orleans, to find a muse in flamenco during my ten years living in Spain was an easy transition, like meeting a long-lost cousin. WHY WOULD SOMEONE WANT TO READ IT? As a friend of mine commented, how dare you publish a book of passionate, musical poetry during an age of discordant irony and snarky self-involvement? I think that any poetry lover wanting to escape from the current norms of nonsensical Language poetry, weepy narcissism, derivative experimentalism, or mannerist workshop poems might find the book refreshing, especially if you like poetry that is by turns lyric, acerbic, socially concerned, and full of attitude. AUTHOR PROFILE: I’m a fifth-generation New Orleans native, one who left home for thirty years, traveled widely, and taught at universities in San Francisco, Florida, Barcelona, Madrid, and Beijing, as well as in New Orleans, where I now live. I’m a widely published fiction writer, poet, essayist, and translator. My eleventh book is Flight Risk: Memoirs of a New Orleans Bad Boy, out this spring with the University Press of Mississippi. Other recent books include You Don’t Know Me: New and Selected Stories (winner of the 2015 Independent Publishers Gold Medal in Southern Fiction) and the novel Higher Ground (awarded a William Faulkner/Wisdom Gold Medal in the Novel). My two previous poetry collections are Why I Live in the Forest and What Moves Is Not the Wind (both from Wesleyan University Press), and I’ve translated volumes of Neruda (Stones of the Sky, Copper Canyon Press) and Jaime Gil de Biedma (Longing, City Lights Books). I’ve also written a book about Whitman, Neruda, and Native American poetics, Poet-Chief (University of New Mexico Press), a study that traces my own influences toward a more oral, tribal poetics. I’ve often performed my poetry at clubs with jazz or flamenco guitar accompaniment, which is when my words really jump alive and soar. This has led me to writing song lyrics (check out “Sky High,” my title song on the latest CD by Kim Prevost and Bill Solley). AUTHOR COMMENTS: Writing poetry is making word music, and writing fiction, memoirs, or personal essays is storytelling, two ancient human instincts. Of course, some of my poems are narrative, and a lot of my prose is musical, but the two forms seem to come from distinctly different places. Writing poetry is easier because it’s short, and is often a gift of inspiration, although perfecting a poem can take forever. Writing narrative prose involves long blocks of time and persistent focus. Returning to live in New Orleans, as much an outrageous story as it is a fascinating place, has inspired my storytelling, both in fiction and nonfiction. So I’m pleased that Drunk on Salt has brought me back to my musical vocation. If you ask most Americans a question, they might offer an opinion, but if you ask a New Orleanian a question, we’ll either tell you a story or sing you a song. Do your taxes on New Year’s Eve. Darn your socks on Mardi Gras. to mope, so go ahead, be morose. Order water. Become a vegan. WHERE TO BUY IT: Small Press Distribution, Amazon, Willow Springs Editions, or book stores.